Legend is defined as an unverified story handed down from earlier times, especially one popularly believed to be historical. Therefore my first reaction was Ven. LP Thuad isn’t real. Perhaps it was the way it was worded or written, I perceived that it has much exaggerations. It was through my Teacher, he had shown me that Ven. LP Thuad is in fact very real with historical facts kept in the Bangkok National Library. And my Teacher has brought me to places where Ven. LP Thuad born, the padi fields where his parent worked…etc ( I will share with you all later.) . It was after much and I read this article written by Khun Songvit Kaeosri, Chief of International Serials Data System Regional Centre for Southeast Asia National Library in Bangkok, that my perception was altered. I will now share with all dear readers this article, it wasn’t written by Khun Songvit as per but he reproduced it based on a historical document called ” Phra Tamra Borom Rajudis phue Kalpana” (Royal Decree to Dedicate all Benefits from Lands and People to the Specific Temples). The following story of Luang Pu Thuad is based on the historical document called ” Phra Tamra Borom Rajudis phue Kalpana” (Royal Decree to Dedicate all Benefits from Lands and People to the Specific Temples). It was a royal command of King Ekadasaroth of Ayudhya in 2153 B.E. 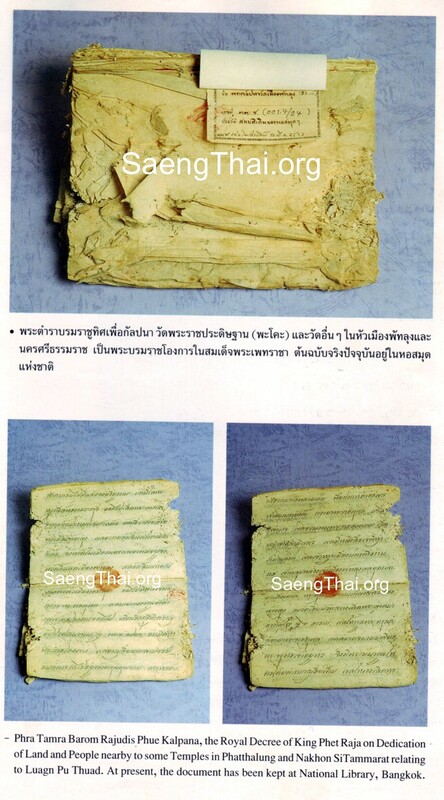 ( 1610 A.D.) This document was discovered by Prince Damrong Rajanubhab-the Father of History of Thailand, then the Minister of Interior, in 2456 B.E. (1913 A.D.) From Wat Khian in Amphoe Sathing Phra, Songkhla. The document described the temples under royal patronage for restoration and dedication of lands and population nearby for the sake of the temples. 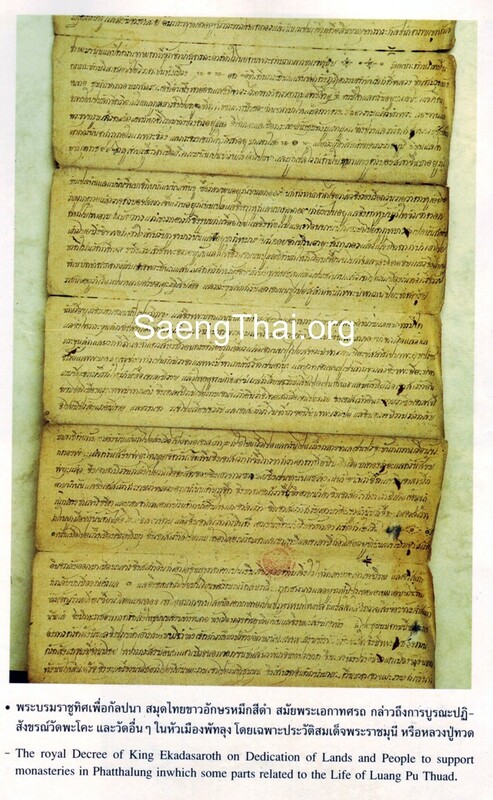 It is fortunate that in this document, the life and roles of Luang Pu Thuad had been given from the beginning of his childhood upto the title of the rank “Somdej Phra Rajamuni Samiramagunupamacarya” in favour of King Ekadasaroth. Luang Pu Thuad was born in 2125 B.E. (1582 A.D.) at Ban Suan Chan, Chumphol District, Sathing Phra in Songkhla, Southern part of Thailand. His parents were Mr. Hu and Mrs. Chan, a poor couple living with Shretthi Pan, the wealthy landlord. The parents named their child as “Pu” (meaning crab). One day while Pu was still a new-born baby, his parents took him out to the rice field and made a cradle by cloth between two trees for their child sleeping bed, and then went over to the paddy field to work. After some time, Chan turned around to look at her baby and extremely frightened when she saw a large snake curling up around the child’s cradle. Chan cried loundly and everybody nearby as well as Hu rushed out to see what was happening. They observed that the snake did no harm their child. With the old belief that this snake might be the God created vision, they worshiped the snake with collected flowers and rice ears and prayed the baby safe. The snake began to uncurl itself the child and left out soon. In astonishment, the baby was still asleep with a crystal ball lit up with many colours at his neck. The crystal ball had been kept and given back to the child when he was grown up. 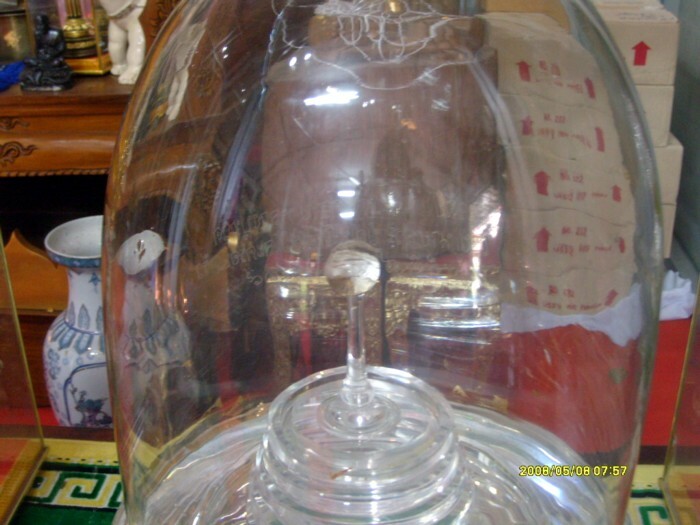 Even today, this crystal ball was still installed at Wat Pha Kho, Songkhla, with a long story of its miracles. Photo (left) Ven. 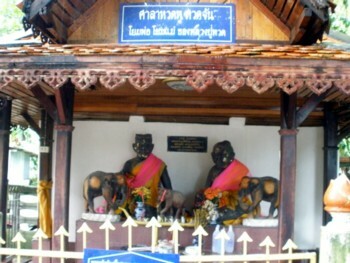 LP Thuad’s parent’s shrine at Wat Ton Liap, Sathing Phra, Songkla. (right) Ven. 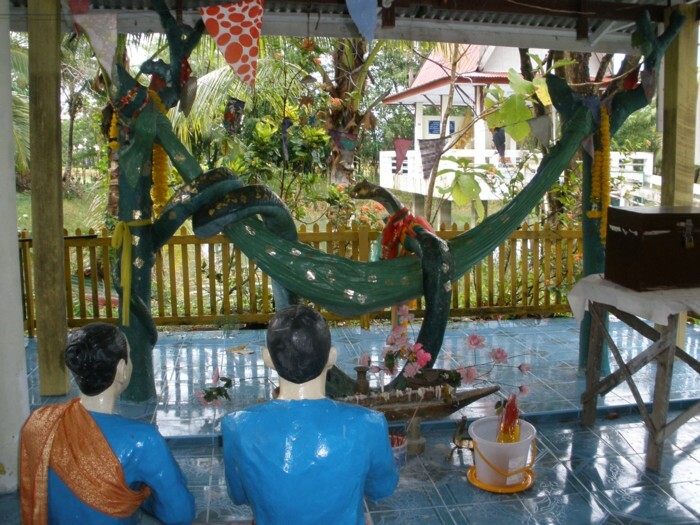 LP Thuad’s parent’s shrine at the padi field they worked near Wat Ton Liap. Photo (above) This is the exact spot where Ven. LP Thuad was laid when he was still a baby at the padi field and the encounter with the snake. Photo (above) is the crystal ball of Ven. LP Thuad that was spitted by the snake. It is kept in Wat Pak Kho until now. Three years of his monkhood under the care of Phra Khru Ka Derm, he studied Dhamma and Pall till its introductory completion. Later on, he wanted to further his study for Buddhist scriptures in Ayutthaya. Then he asked the permission from his preceptor and accompanied Mr. In, the large sampan owner, to Ayutthaya. Three days after sailing out into the open sea, then one day they turned very rough and stormy. The ship had to anchor until the sea calmed down. At this hard time, the fresh water for drinking and cooking on the ship had run out. Everybody, especially the ship owner In, was furious and blamed the monk as the cause of ill fortune and expelled him down from the ship. While Bhikkhu Pu sat in a small boat ready to move forward, he dipped his foot into the sea and told the sailor to fetch the sea water from where he had stepped to drink. The sailor felt astonished when he had tasted the sea water and it became the fresh drinking water. When Mr. In and everybody on the ship were told, they came to taste and fetched the fresh water from the limited circle and stored all the water supply they needed for the rest of the journey. Through the miracle, Mr. In and his sailor realized of their guilty with the monk. 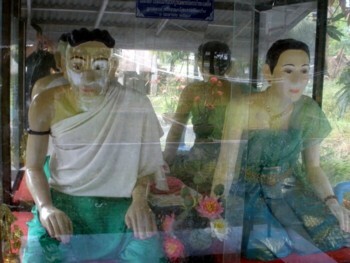 They fell down to the feet of the monk and begged him pardon, then invited him to ship on to Ayutthaya again. When the ship reached to Ayutthaya, Mr. In took Bhikkhu Pu to reside with the Abbot of Wat Khae and rendered Nai Chan, his servant, to follow the Bhikkhu as his temple-man. For some time with trade, Mr. In shipped back to Nakhon Si Thammarat. Photos (above) This is the main Ven. LP Thuad veneration shrine at the entrance of Wat ChangHai, the front is his image and the chedi that kept his bone ashes is behind the image. In Ayutthaya, while Bhikkhu Pu had studied Buddhist scriptures at Wat Lumbalinavas, there had a gamble from King of Sri Lanka to have Challenged with King of Siam to translate all of the golden alphabets into the Buddhist Scriptures to the correct order within seven days. If all the requested be met and finished in time, the King of Sri Lanka would then give all of the treasures on the seven sampans to the King of Siam as tribute. Otherwise the King of Siam had to pay the tribute to the king of Sri Lanka. Within the capital city a Ayutthaya, no one could meet with this challenge. Six days of anxiety of the King passed. At last it was found that a young Bhikkhu named Pu or Samiramo left and was summoned to solve the challenge. The young monk went to the assembly, paying his respect to Maha Sangha, then encountered with seven Brahmins from Sri Lanka. Photo (left) A standing image of Ven. LP Thuad at Wat Ton Liap, his birth place. Bhikkhu Pu started to re-arrange the golden seeds into the Dhamma accordng to Buddhist texts with no difficulties. The 84,000 units of the golden seeds were all used up except seven seeds left missing. They were Sam (Dhammasangani), Vi (Vibhanga), Dha (Dhatukatha), Pu (Puggalapannatti), Ka (Kathavatthu), Ya (Yamaka) and Pa (Patthana) which are the heart of the seven scripturers of Abhidamma Pitaka. The young monk turned to the seven Brahmins and asked if they had kept the missing golden seeds. When they were given, the complete rearrangement of golden seeds into Buddhist scripture of Abhidhamma was finished with correction in the 7th day, the Brahmins as the Ambassadors of King Sri Lanka had then given all the treasures of 7 sampans to the young monk but he turned everything away and gave them all to the King. 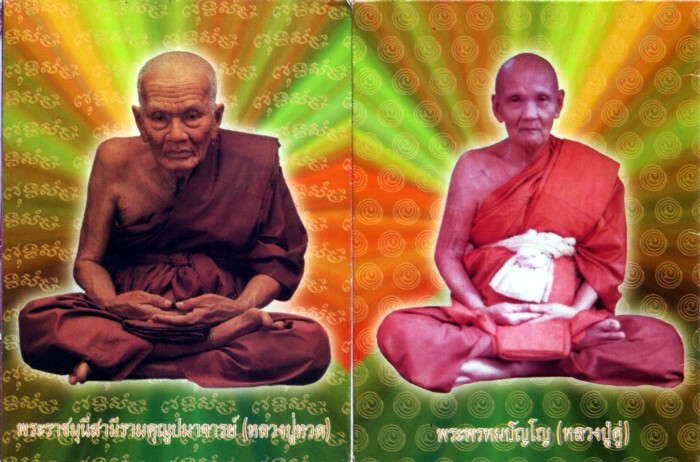 Being favourite to King Ekadasaroth of Ayutthaya with his knowledge and wisdom, Bhikkhu Pu had been bestowed upon the Sangha title of “Somdej Phra Rajamuni Samiramagunupamacarya” the most higher rank ever given to any other pedestrian monks before in the country. 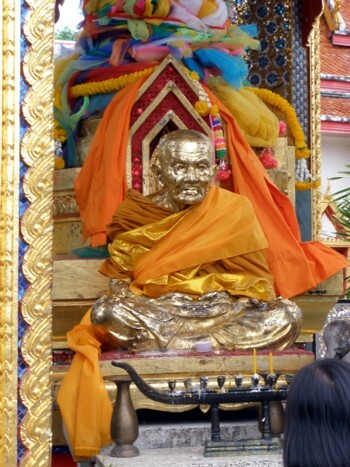 Somdej Phra Rajamuni Samiramagunupamacarya or Luang Pu Thuad had stayed in Ayutthaya to have adviced to the King many ways till his old age and then asked for permision from the King to go back his home town. The King had permitted with a promise to give all the supports requested by Luang Pu Thuad in turns of his virtuous deeds. 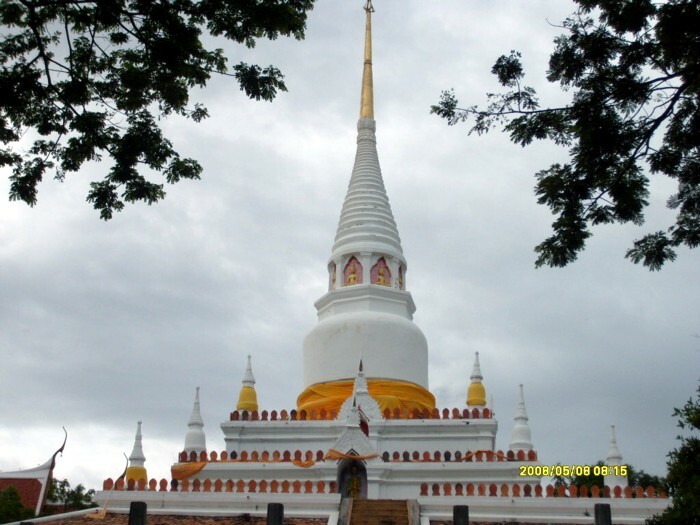 When Luang Pu Thuad was back to Wat Pha Kho, his home town, he found the Wat mostly ruined and thus sent a messege requesting the support to restore the temple to the King. King Ekadasaroth was pleased to respond to Luang Pu Thuad needs, he gave all supports to the said monastery and graciously issued the Royal Degree on Dedication of Land and people of about 250 families nearby Wat Pha Kho as beneficial to the temple. 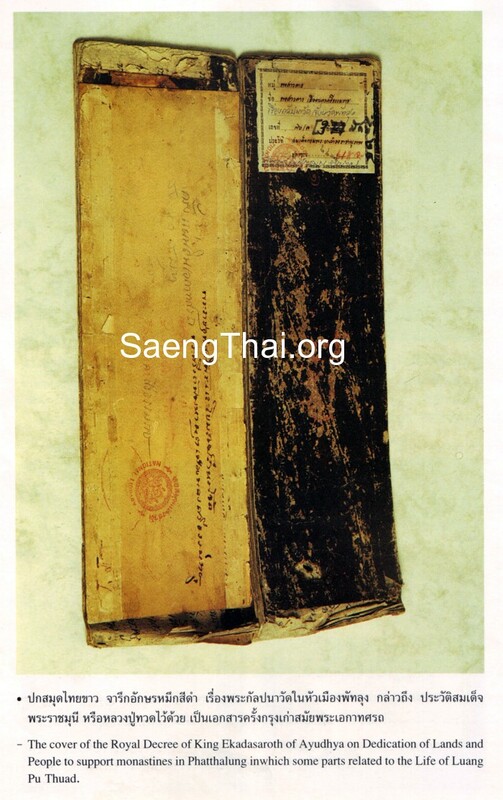 The Royal Decree was later successive to Wat Khian possession and given to prince Damrong Rajanubhab in 1913. At present it was kept in the National Lihary, Bangkok. 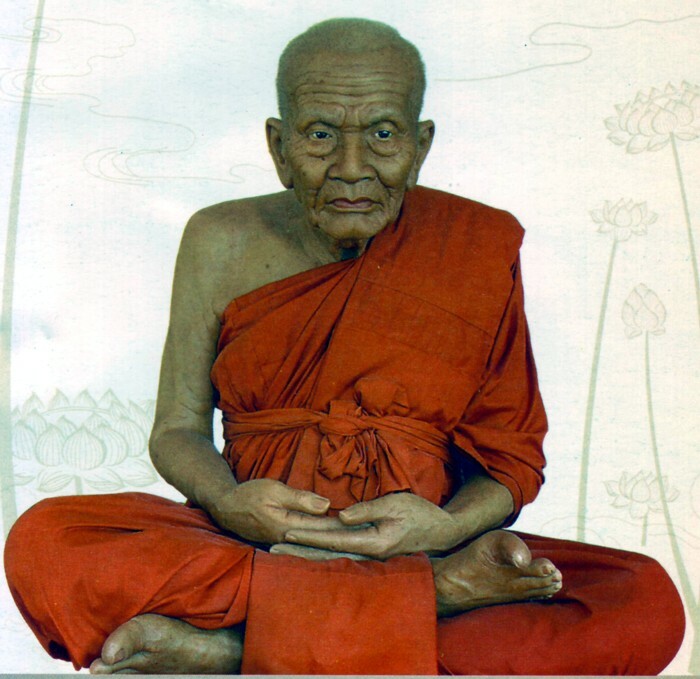 Luang Pu Thuad had spent his life for the sake of the people without impartiality. Lastly, he had vanished from Wat Pha Kho along with a young novice to preach Dhamma and helped people at various places in the South up to Malaysia, Singapore and Sri Lanka. 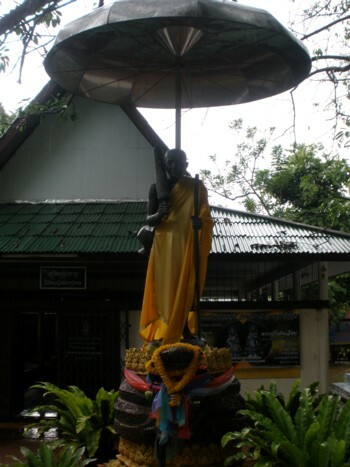 His second permanent residence was at Wat Changhai, Pattani. His date of passing away was not certain. 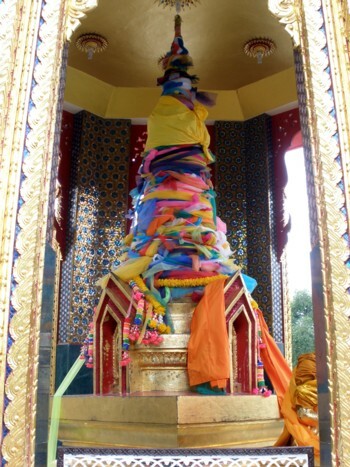 Through his psychic attainments (abinnya) and miraculous virtues, Luang Pu Thuad came into manifestation in the imagination and dream of his disciples, and then there had been made his amuletic images firstly at Wat Changhai in 2497 B.E. (1954 A.D.). His amulets have showns many miracles to many experienced individuals from time to time. 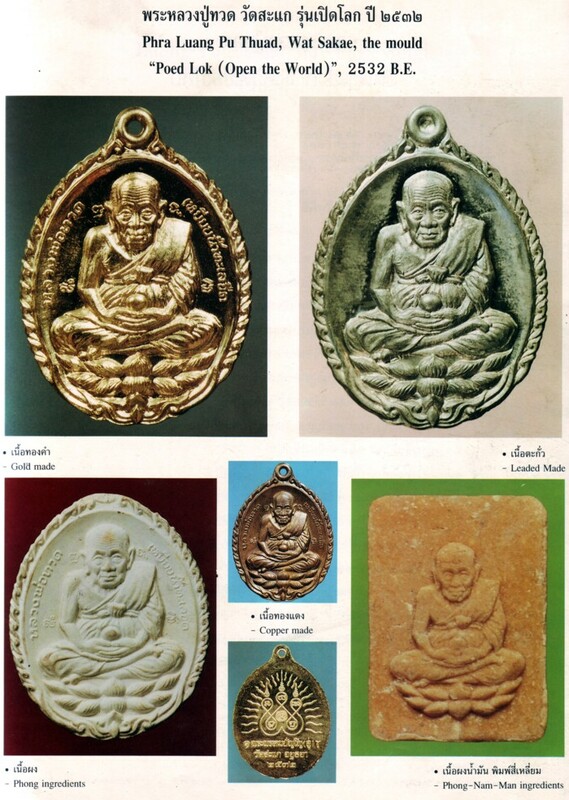 Many batches of his amuletic images have been erected again and again with the most popular of them have been collected and included in this book “Luang Pu Thuad : The Story of His Life and Amulets”. 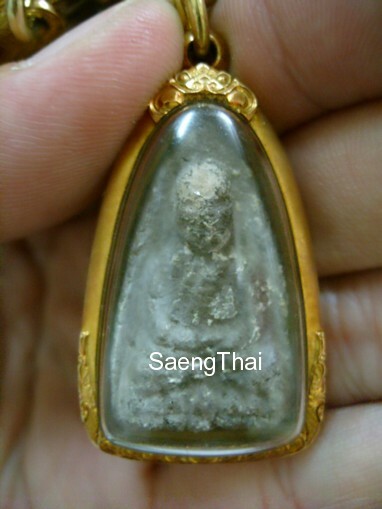 It is worthy to learn that at present some type of the first batch of Phra Luang Pu Thuad created in 2497 B.E. (1954 A.D.) cost more than Baht 1,250,000 orÂ USD$50,000 each. 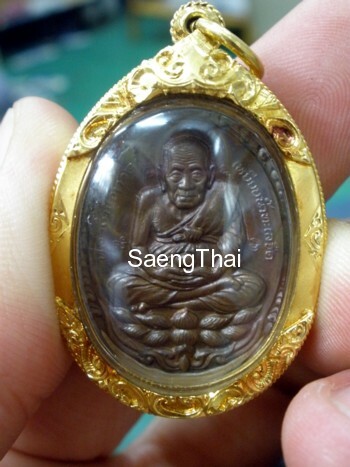 It is believed that in Thailand no any other monk has gained more reverence than Luang Pu Thuad for his amulets are of both increasing numbers and miraculous virtues. The end of article by Khun Songvit. Sharing on Ven. Luang Pu Thuad would not be complete without introducing Ven. LP Du of Wat Sakae. The reason being, Ven. LP Du has often been referred as the 2nd Ven. LP Thuad due to his saintly practices and spiritual attainments. The small altar images of this batch were hand-moulded by Luang Pu Du himself, later some metallic images were created by using moulds. 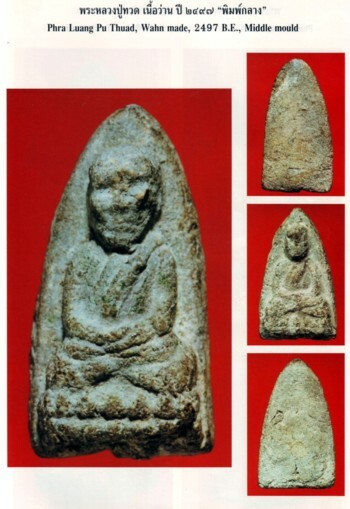 Besides, there were some votive tablets of white Nua Phong, which were created by using many kinds of moulds. Luang Pu Du distributed them to the disciples who came to practice meditation with him, so we called “Phra Phong Kammatthan or also known as Pong MahaCakapat ( the King of all Pongs ). Ones of the backside of some votive tablets of Luang Pu Thuad were stamped the IN. letter which meant “Brahmapanno”, the religious name of Luang Pu Du. They had been found in Luang Pu Du’s manse after his death. A lot of people have believed in all of the amuletic images which Luang Pu Du created, for they have high extraoridinary phenomenas of the Buddhist virtues. They are very old and worthy of collection. 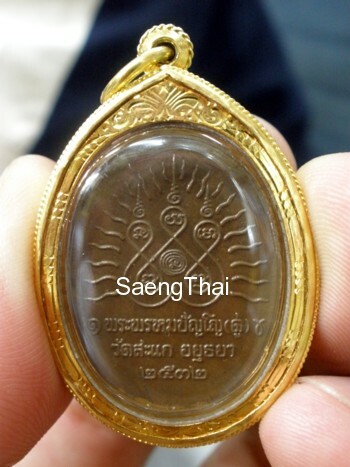 For example the rian ‘Poed Lok” 2532 is the most saksit among all his collections and also the most expensive but unfortunately also the most duplicated. Poed Lok symbolises/means the bright positive aura or energy that dispels all darkness or ignorance. Collectors whom are enthusiast of Ven. LP Thuad amulets should not miss this collection. Next Post - Next post: Happy New Year!! !